Native plants exist for nearly every garden need including great variety in plant form, flowers, foliage and fruit. Natives will provide an ideal refuge and source of food for birds and animals. Many natives can survive under extreme drought conditions. Many natives are evergreen, providing a delightful mix with deciduous plants for a year long, attractive garden. 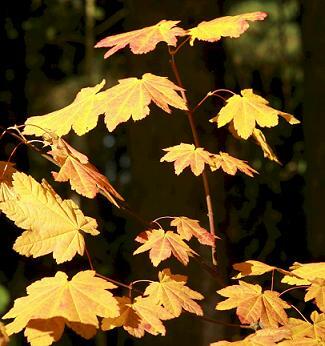 In the Pacific northwest there is a natural relationship and function for native trees, shrubs and perennials. Native trees, both evergreen and deciduous, provide the over-story framework of the landscape. Below tree level, shrubs provide an understory. Below the shrubs, perennials including ground covers complete the natural landscape. Shrubs and perennials provide delightful color, texture and form. Some common questions and answers are shown below. Accept and enjoy natives as they are. Enjoyment of natives implies an acceptance of the simple joys of nature - not a continual frenzied search for the different, the bigger, the brighter, the new. Did you ever really look at a native rose? Just a simple single petal flower - pale pink, nostalgic fragrance. How beautiful, how fragile and yet eternal! How close to the land and how close to life! 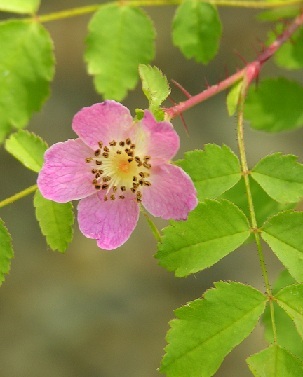 If you can enjoy a simple wild rose, your life is greatly enriched! Nearly all native trees do fine in full sun. This includes Fir, Cedar, Spruce, Hemlock, Pines, Oaks, Madrone, Oregon Myrtle, Maple, Alder, Birch, Hazel, Cottonwood, Quaking Aspen, Willow, Hawthorn, Plum, Cherry, Crabapple, Dogwood, Oregon Ash and Cascara. Spruce, Hemlock, Pacific Silver Fir, Grand Fir, White Fir, Coast Redwood, Port Orford Cedar, California Black Oak, Canyon Live Oak, Tan Oak, Big Leaf Maple, Oregon Myrtle, Cascara. West. Hemlock, Sub-Alpine Fir, West. Red Cedar, Vine Maple, West. Hazelnut, Pacific Dogwood. Pacific Rhodie, Salal, Evergreen Huckleberry, Red Huckleberry, Elderberries, Oregon Grape, Indian Plum, Devil's Club, Salmonberry, Twinberry, Pacific Wax Myrtle, OR Boxwood, Ninebarks. For deciduous trees and shrubs, consider plants in the Willow family - Cottonwood and all the Willows. Consider the Birch family, including Birches and Alders. 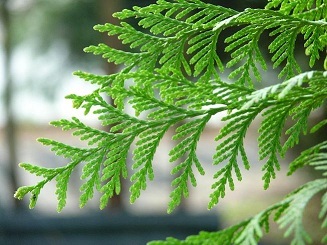 Western Red Cedar is the best conifer for wet areas. Bog Rosemary, Skunk Cabbage, Cat-tails and Yellow Leaf Iris (Iris chrysophylla) all do well. Check native plants growing in non-cultivated areas in your vicinity as a start. Once established, most natives will go through the typical July - Sep dry period without water. The two toughest attractive native plants in the Willamette Valley are Doug Firs and Tall OR Grape, in my opinion. Many perennials, such as Camas & Trilliums go dormant in the dry season. Andromeda polifolia (Bog Rosemary), Arctostaphylos uva-ursi (Kinnikinnik), Asarum caudatum (Wild Ginger), Ceanothus prostratus (Squaw Carpet), Cornus canadensis (Bunchberry), Dicentra formosa (Bleeding Heart), Fragaria chiloensis (Coastal Strawberry), Gaultheria shallon (Salal), Linnaea borealis (Twinflower), Mahonia repens (Creeping Oregon Grape), Maianthemum dilatatum (False Lily-of-the-Valley), Oxalis oregona (Oxalis), Smilacina stellata (Star-Flowered Solomon's Seal), Vancouveria hexandra (Inside-Out Flower). Native ferns are shade plants. Do not use in full sun. Use the magnificent native Sword Fern as a strong design element in the shade garden - supplement with other fine native ferns. Northwest native plants like the northwest! This is their home. As good gardeners, you want to protect your investment and give the little guys and gals a head start. I suggest some extra water in the normally dry and hot season--July, August and into September--for two years. The new plant needs to get roots deep into the soil to find moisture. Select the site carefully. Some plants can stand a lot of winter weather, even submerged as Oregon Ash and Willows. This kills some plants such as Madrone. Research this need before planting. As a general rule, a well drained site is best. Dig the hole wider than the diameter of the pot - up to 50% larger. You need to set the plant so the new soil level is the same as the soil level in the pot – the same soil line. However, shape the area around the plant into a shallow “dish” which will hold a temporary source of available water when watering the plant and not run off. This can be 2 or 3 inches deep. The bottom of the root ball should usually be on solid soil with some extra depth surrounding. It is best to dig holes the day before planting and fill with water to saturate the soil before planting the next day. If the soil in the pot is rather dry, water the plant in the pot the day before planting. Most NW soils are acid and many soils are heavy clay with little humus material. If your soil is too heavy you might amend the soil with some peat moss and sand or better yet, finely ground pumice. If you go to the trouble of amending the soil you might as well add some general purpose fertilizer (12-12-12) with minor elements to the excavated soil. 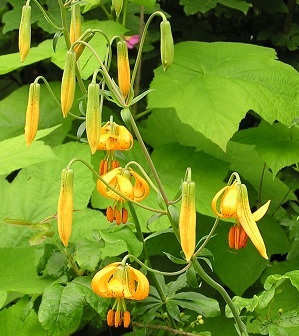 However, native plants do not need large amounts of fertilizer. If your soil is very heavy clay, the hole you dig may be smooth and slick on the sides. This may cause roots to “circle.” Counter this by roughing up the sides so the roots will penetrate. You might also punch several holes in the bottom of the hole you have dug by driving down an iron rod and then removing. Hopefully the roots will find these openings and get down deeper, faster. Backfill and then pack the soil tightly around the plant. Commercial Tree Planters have a fixed routine of “stomping” on both side of the new transplant to pack the soil. This is OK but if a hose is available, “water pack” the soil by flooding with water. Now prepare the top surface of the soil around the plant to save summer water. Apply a generous layer of mulch. Garden stores carry various mulches – larger wood chips are good. Apply 2 or 3 inches of mulch around the stem and out for 2 or 3 feet. Thick mulch keeps the soil damp and greatly reduces the amount of summer water needed. When you do apply summer water you can, if you like, pull the mulch back, water and then replace. The above indicates hand watering. You certainly can rig timer-driven drip lines. These use little “spitters” to place a controlled amount of water at the base of the plant.. This method applies water exactly where you want, in the amount you want, automatically. Here is a method that conserves maximum water but more initial work on your part. Buy a length of PVC water pipe at least one inch in diameter. Cut a piece with a hack saw about 2.5 – 3 ft tall. When you place the plant in the prepared hole and start to backfill, place the plastic pipe section so one end of the pipe is right in the middle of the roots. Slant the pipe upwards at a sharp angle and backfill. The 1” pipe will allow you to apply water with a narrow tip hose nozzle through the pipe directly to the roots. Tip: do not drive the pipe through the soil as this will plug up the pipe. Consider placing some sand at the lower end of the pipe to expedite watering. There is another method of saving water which may be controversial. Peat moss, once dampened, absorbs and holds water like a high capacity sponge. Create a peat moss sponge to hold water just below the root level. To do this, dig lower that described above and place a “pillow” of damp peat moss in the hole. Combine this with the water pipe above and you have reduced the water needs to the very basic level. How often to water? Every plant has a different water need. I suggest you experiment a bit. Do not water until you see a slight “droop” of the leaves – the plant is asking for water. This works with deciduous plants but not with conifers. Sometimes you can use plants like coal mine canaries – if the tested plant starts to droop, add water to all plants. A 'calico fence' is a mixture of different shrubs or small trees planted in a row. It's a living fence that makes a colorful and ever-changing border or noise barrier, good for privacy and definitely not boring. A one-of-a-kind feature you create yourself just the way you want it. Plant a patriot's fence--Red-Flowering Currant (Ribes sanguineum), Serviceberry (Amelanchier alnifolia), and Blueblossom (Ceanothus thrysiflorus). Go for a white fence--Goatsbeard (Aruncus dioicus), Snowbrush (Ceanothus velutinus) and Mock Orange (Philadelphus lewisia). A tall windbreak of exquisite colors can be created with two or three kinds of evergreen trees in a repeating pattern. Year-round beauty! For Trilliums select a site that will have mostly shade. Trilliums like humus – especially humus formed from decaying leaves. Amend the soil as needed with compost, mostly from leaves. Amend soil if necessary, to a depth of 12”. Do not add chicken or cow manure. Do not use mushroom compost. Peat moss is good. Trilliums bloom around Easter time and the top stems die back by June or early July. Underground, a new, small primitive white stem forms and grows about 1” or less, from the site of the previous stem on the rhizome (bulb.) It then stops growing and will not start up until it goes thru the winter cold. 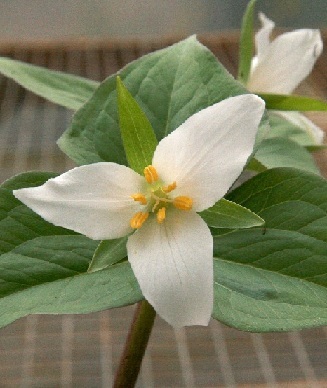 Plant the trillium so the white stem is 1 – 2” below the soil level (roots down, stem up.) Water in to pack the soil and then no more water until the winter rains come. By late Jan or Feb the trillium will start to grow. At that time the trillium needs plenty of water, hopefully from winter rains. After blooming, let the plants go dry to repeat the annual cycle. Plant the rhizome (bulb) with the roots down and the white primitive stem pointed upward. Fawn Lilies like partial shade. Amend the soil as described for Trilliums above. Plant bulb about 3 inches deep. Place a small chip of wood or stone just below the bulb to stop the bulb from going deeper. Fawn lilies have a habit of pulling themselves deeper and deeper, maybe to extinction. If I plant a Fawn Lily in a pot near the top of the soil, by the end of summer, the bulb has worked itself to the bottom of the pot. Tiger Lilies like partial sun, partial shade. Prepare the soil as noted for Trilliums above. This is a true bulb with segments. 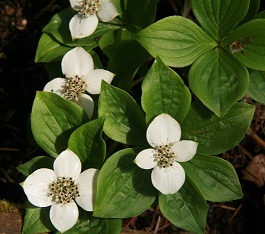 Plant about 5 – 6” deep in the same soil as for trilliums above. All the above bulbs/rhizomes can be planted in July – August in slightly damp ground but do not water. They can also be temporarily stored from July through early September, when all should be planted out in the garden. To store in the summer, place in peat moss which is very slightly damp and store in the shade in a cool place – protect from squirrels, etc. It's almost Bare Root Time! Less work! Because there is no soil to worry about, bare root plants are easy to plant. If you've ever struggled to get a plant out of it's pot so you can plant it in the hold you've just spent an hour digging, you know how hard it can be. But bare root plants are all ready for you to pop into that hole and shove some dirt around them. How simple is that! they will break dormancy right in their permanent home and settle in quickly. 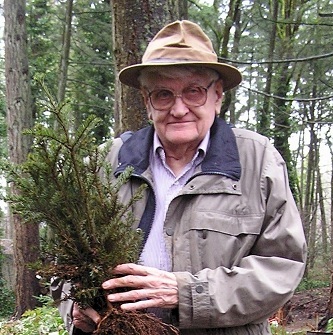 Here's Wally holding a bundle of 5 or so bare root Noble Firs (Abies procera). These plants would be potted in 1-gallon pots for nursery sale. Try to imagine how difficult it would be to hold up these same plants if they were already potted up. Whew! Less cost! Bare root plants are newly propagated and ready to begin their life in your garden. Instead of the grower potting them up and tending them for months until they are ready to sell, you get the fresh stock and plant them yourself. No need to pay the extra money to the grower! More plants! With the same gardening budget, you can get sometimes twice as many plants as you'd pay for those already in containers. Such a deal! Quicker growing! Bare root plants start their annual growth cycle already in your yard. They skip the stress of being potted and then being planted in the ground when you take them home. They establish better and sooner than a transplanted container-grown specimen. Plants in pots are easy to grow, as the roots are well established. Bare root plants require more gardening skills than potted plants. Planted in September, the soil is still warm and roots establish in the Fall. In the early spring, they start growing vigorously. Bare root plants, planted in the winter and early spring, will be about a year behind potted plants, planted in the Fall. Plants have been growing in pots through the summer and are very lush specimens, some quite large. Bare root plants cost less than potted plants. Very economical for large plantings, living fences, etc. It depends on you--do it your way!